The EQA concept features blue LED stripes along the side and back, and an LED nose panel. 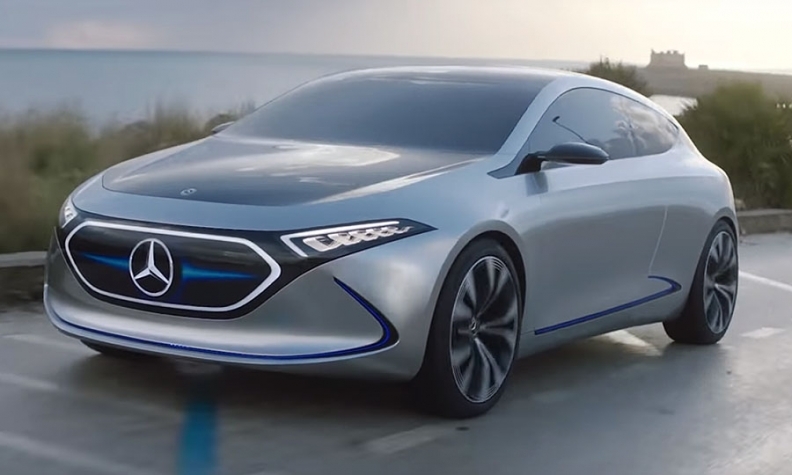 Mercedes-Benz has released a video of the concept version of its Tesla Model 3 competitor -- the EQA. The EQA is an electric version of Mercedes' A-class compact sedan. The video, which mostly shows sweeping views of the Sicilian countryside, signals that the EQA hatchback will have blue LED stripes along the sides and back and an LED nose panel. Unlike most concept cars, the EQA sports side mirrors instead of cameras. The vehicle's interior is not visible. Mercedes expects to launch the EQC, an electric compact crossover, next year. An S-class variant, the EQS, is also on the product road map. The EQ entries -- 10 of them by 2022 -- will have body styling distinct from existing Mercedes light vehicles in their segments. The 10 electric vehicles are part of 50 electrified vehicles planned by 2022. Those 50 also include plug-in hybrids, fuel cell vehicles and vehicles with 48-volt electrical systems. Mercedes parent Daimler has said it expects between 15 and 25 percent of its global sales to be EVs in 2025.